Are you having difficulty moving your neck in a full range of motion? By learning the symptoms of your neck pain and finding the source, the chiropractors and medical staff at Advanced Care Specialists in Racine and Mount Pleasant, Wisconsin, can develop a treatment plan personalized to your individual recovery needs. Neck pain can be the result of injury and accidents, osteoarthritis, spinal stenosis, degenerative disc disease, or just triggered by activities in your daily life, such as posture and obesity. To learn how Advanced Care Specialists can help alleviate your neck pain, call for a consultation or book your appointment online. A National Institute of Health Statistics survey indicates 15% of the population suffers from a form of neck pain. Osteoarthritis of the neck (cervical spondylosis) is present in as much as 50% of those over the age of 50. Disc problems are present in as many as 40% of men and 28% of women between the ages of 55 and 64. There are seven vertebrae that are the bony building blocks of the spine in the neck (the cervical vertebrae) and that surround the spinal cord and canal. Between these vertebrae are discs, and nearby pass the nerves of the neck. Within the neck, structures include your neck muscles, arteries, veins, lymph nodes, thyroid gland, parathyroid glands, esophagus, larynx, and trachea. Diseases or conditions that affect any of these can lead to neck pain. What can I expect during an evaluation for neck pain? Prior to your exam, your chiropractor asks about when your pain began, what prescriptions you may have used, and other treatments you have tried in order to alleviate your pain, as well as what, if anything, made a difference in your symptoms. With a neurological exam, your chiropractor checks your reflexes and muscle strength, while also observing changes in your nerves. Additionally, you can expect your doctor to monitor any increase or decrease in your levels of pain. 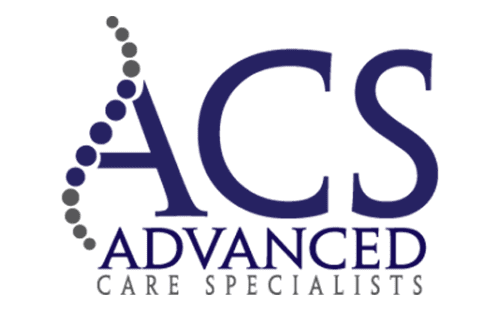 Advanced Care Specialists ensures you are properly prepped for the best treatment options following this comprehensive and thorough examination. What methods do you use to diagnose neck pain? What are treatment options for neck pain?